The ideal behavioral formula for investing in the stock market is to decide on a companies worth (means of doing this are up for interpretation). Divide the total worth by the number of shares. This is the true value of that company's shares. However, due to paranoia about fluctuations in the stock market people often don't follow this very simple principle. Stock Tracker will help you do this. You'll never have to check stock prices. You'll be alerted if the stock price dips below a threshold (it's undervalued and you should buy) or if it's above a threshold (it's overvalued you should sell). By setting these thresholds on stock Tracker you'll receive text or email notifications whenever one of these thresholds is passed and you can proceed to take action. 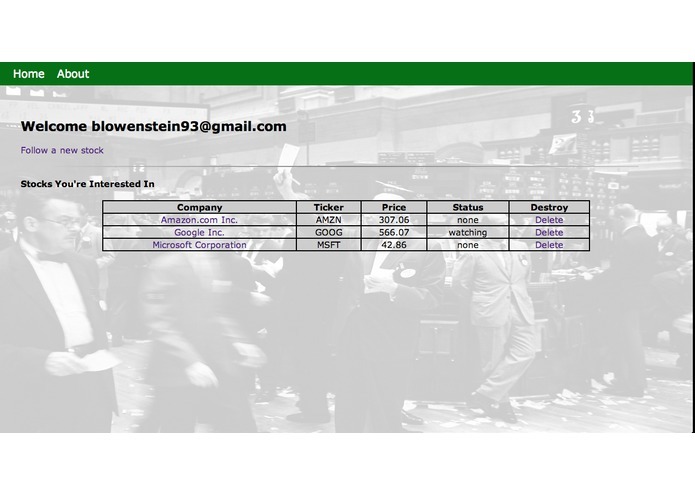 I'm in the works of integrating with e-trade and other online trading platforms' apis.